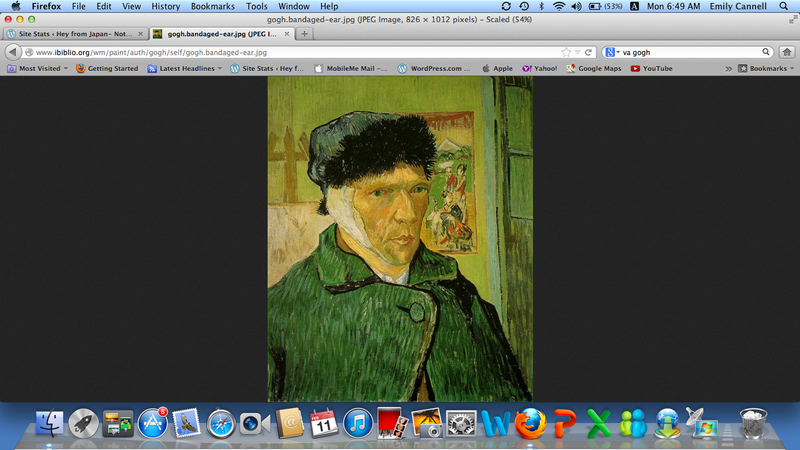 I now know the true reason van Gogh cut off his ear for the Clampitts recently faced similar circumstances. A well-intentioned van Gogh signed on to a group tour of the South of France in order to divine inspiration from the picturesque surroundings. Upon arrival he discovered the only way to enjoy the bucolic setting without having to listen to the woman next to him complain about her hemorrhoids was to cut off his ear. After the removing the ear, he was still able to hear the screaming of the kids forced to participate but too young to be without an afternoon nap and a bottle as the listening part of the ear was still in tact. He then stuffed his ear canal with cotton and covered it with gauze. This was not enough to drown out the prattle of the tour guide determined to impart 1500 years worth of farming history in to an hour`s bus ride. He finally decided to tease his hair in the front, wear his painter`s cap backwards and adopt a maniacal stare in order to appear crazy and unapproachable. This didn`t solve the problem that he was bored stiff while waiting on his compadres to buy every kitschy souvenir available before the bus could leave so he painted a self-portrait while waiting. 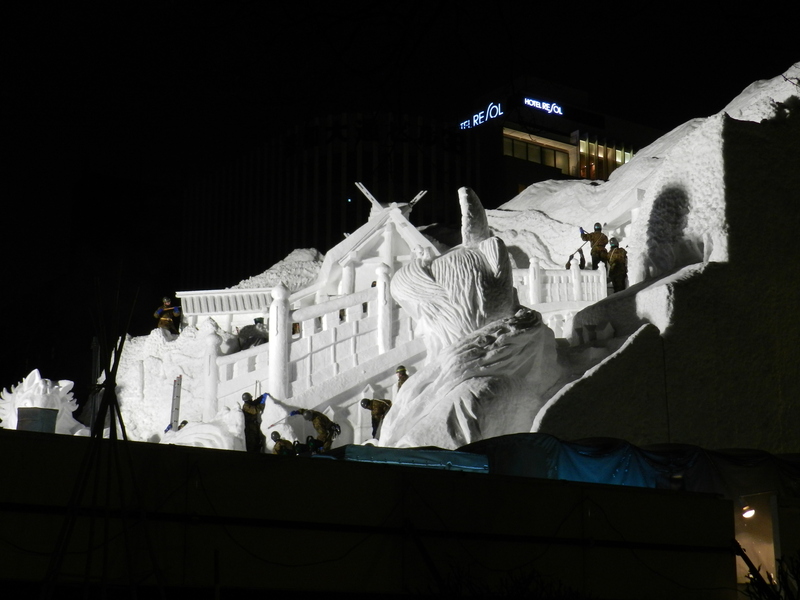 The Clampitts just returned from a 3 day tour of the Snow Festival in Sapporo. Like van Gogh, I was half crazy by the time we were given our freedom. Picture a bus load of Western tourists posing for pictures in front of a wooden 1800`s Western style building dominated by a clock tower. Two teenaged offspring and their mother watching. Oh the wisdom of kids in pointing out one`s flaws. It got better. The pictures will be in the next post. 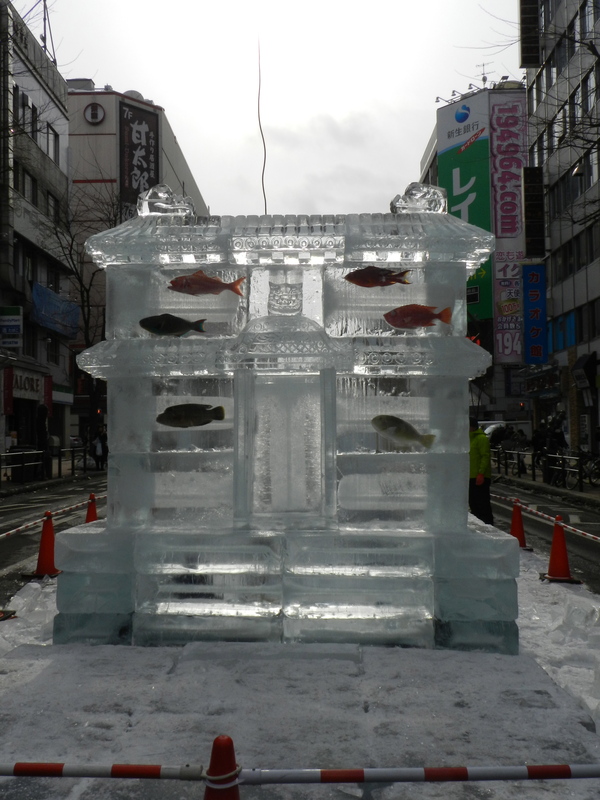 On the third day we were free to wander the Snow Festival unencumbered by the bus. 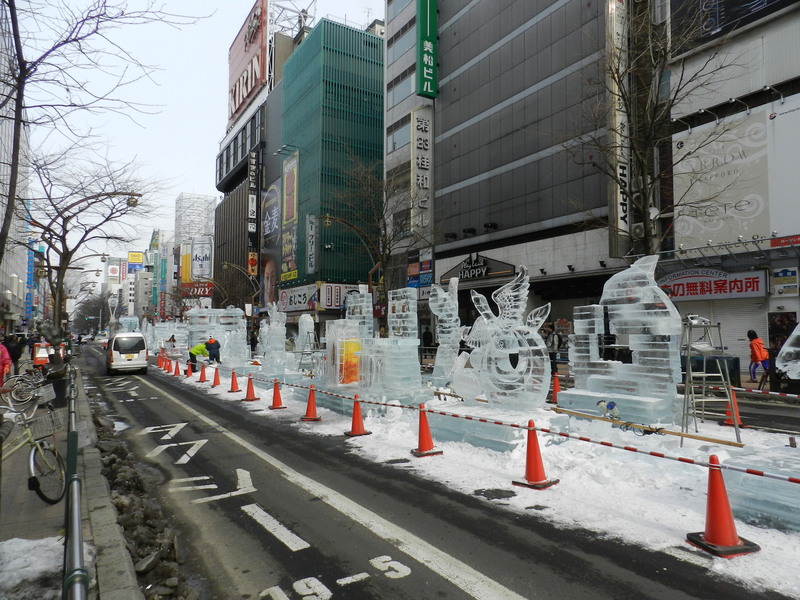 Two boulevards were set up with Snow and Ice Sculptures. 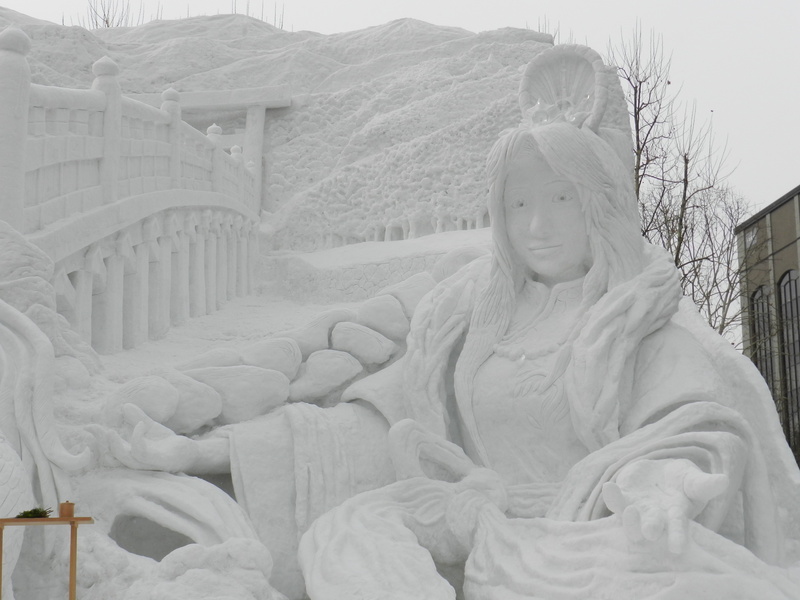 The snow sculptures were all carved by the military reserve units. Although only a short ferry ride from Sapporo to Russia, the military must feel fairly confident that this skill is a useful one in case the defense of Japan is necessary. I remember loving Ultra man as a kid but I don`t recall him being cross-eyed. 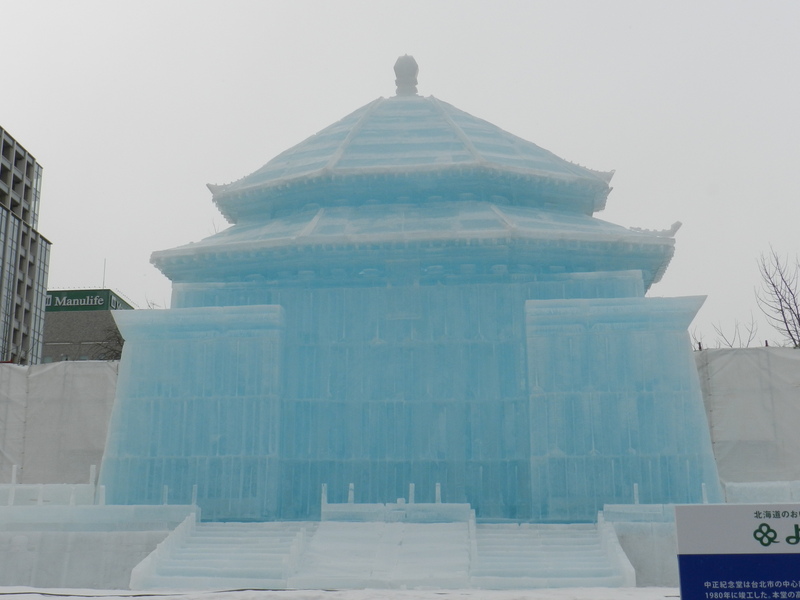 The official opening was not until the afternoon of our departure and most of the Ice Sculptures were under construction. I was ready to pony up to this. We spent as much time with the food as we did the Sculptures. 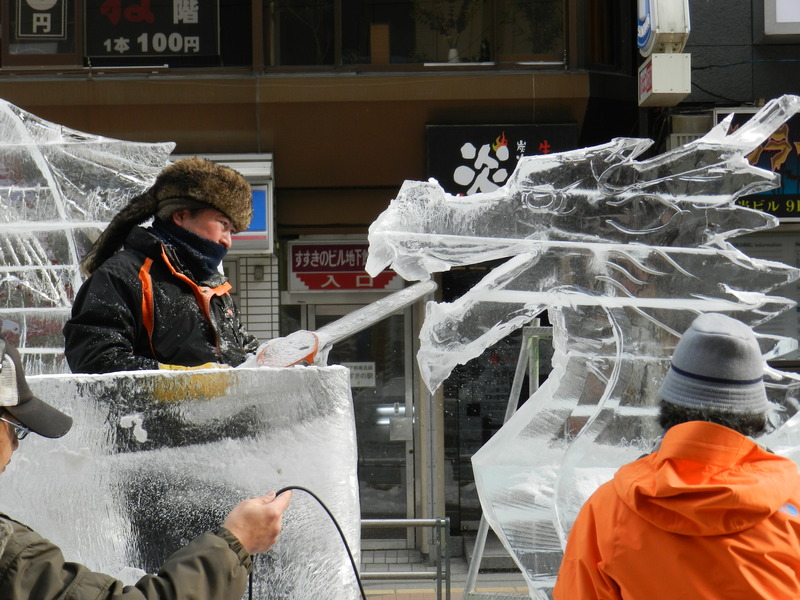 This entry was posted in Moving to Japan and tagged Amblerangel, Culture, Emily Cannell, ExPat, Family, Hey From Japan- Notes on Moving, Humor, Japan, Moving, Sapporo, Snow Festival, Tokyo, Travel, Vacation. Bookmark the permalink. 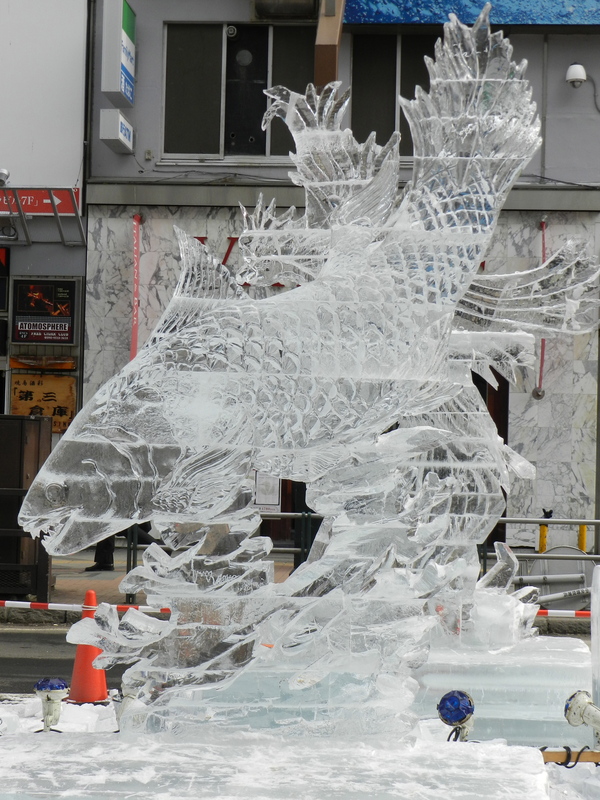 Love the ice sculptures. It would be awesome to be so good at sculpting something so fast . Interesting that they also bring the snow in from the mountains so it`s nice and white. I don`t know how long it takes to actually create. I should have paid attention on the tour bus. Reblogged this on Das Culturas. Thanks JD! 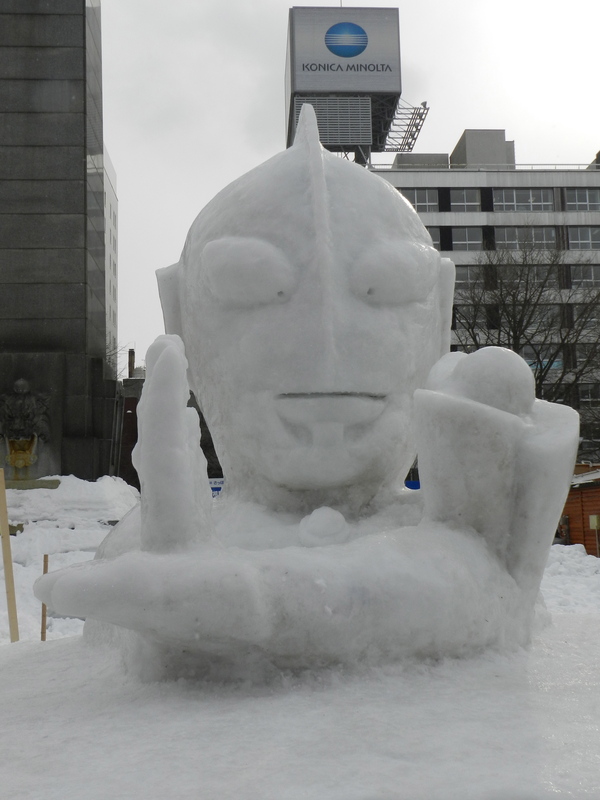 I really don`t know how one just picks up a shovel and creates these things! Thanks! Hope the sail is going fine! Need to stop in and check on you. 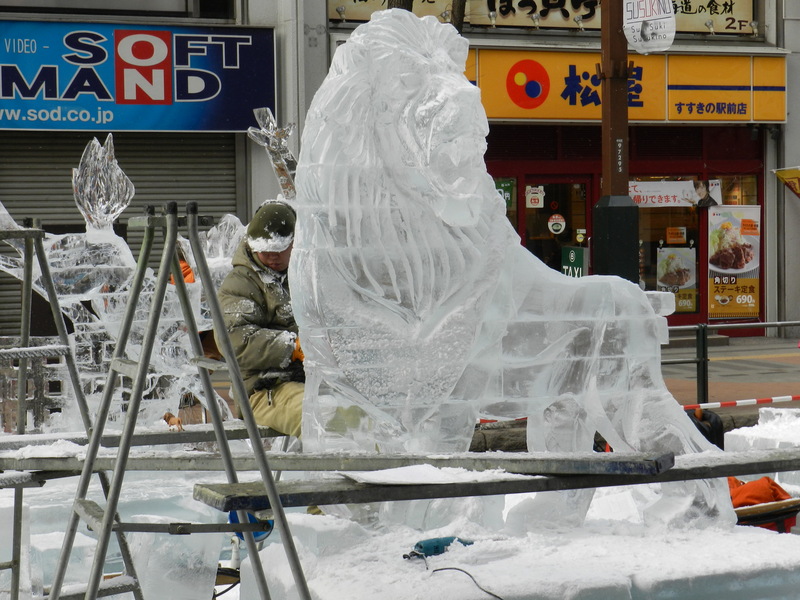 Hmmm…..those ice sculptures look remarkably similar to the ones we saw last year, so I’m not sure you missed too much by them being unfinished, since you can harness the power of Google, LOL. 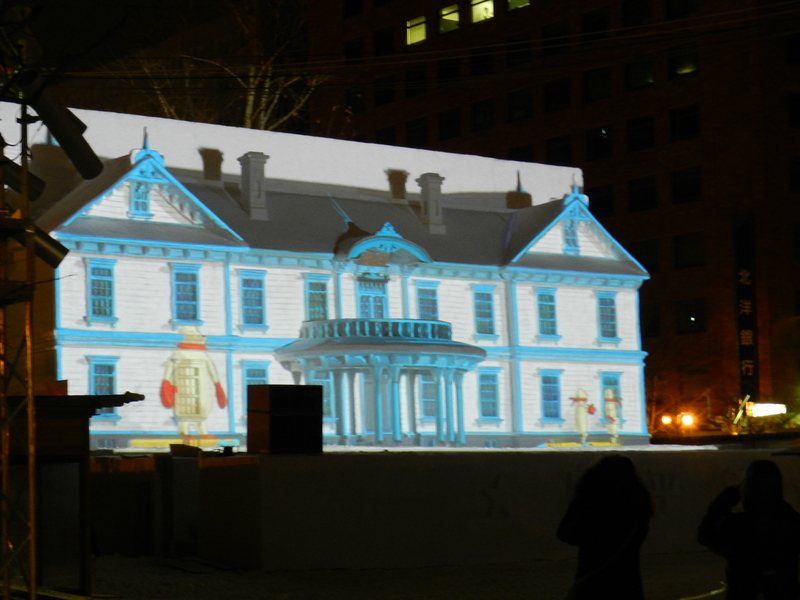 Did you make it out to the other site for the sledding, etc? (although I seem to recall you don’t care for the cold, which makes me giggle about this entire expedition)! Interesting….. OS#1 snowboarded the whole time and I took advantage of not having to host him by seeing the sites. Like the clock tower. And the red brick government building. At which point I suffered a breakdown and sprinted for Starbucks- OS#2 close on my heels. Another place I never made it to while living in Japan. That said, I did get my first bachelor’s degree from Mich. Technological University (MTU) in the UP of Michigan. 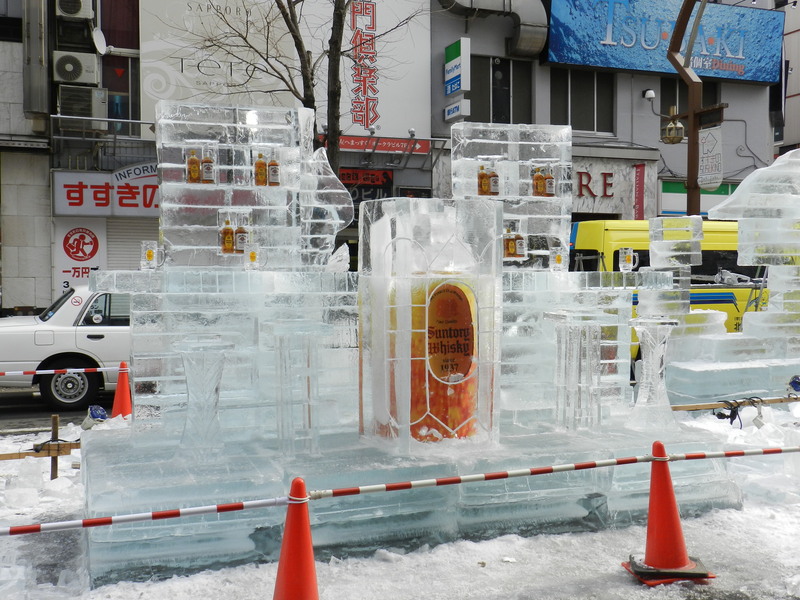 They have a Winter Carnival every year, first weekend of Feb. I haven’t been there for it in person for too many years but this is similar to what happens on campus. I even helped my dorm floor with an all-nighter one year, which involved my first experience (and last) with Mad Dog 20-20. 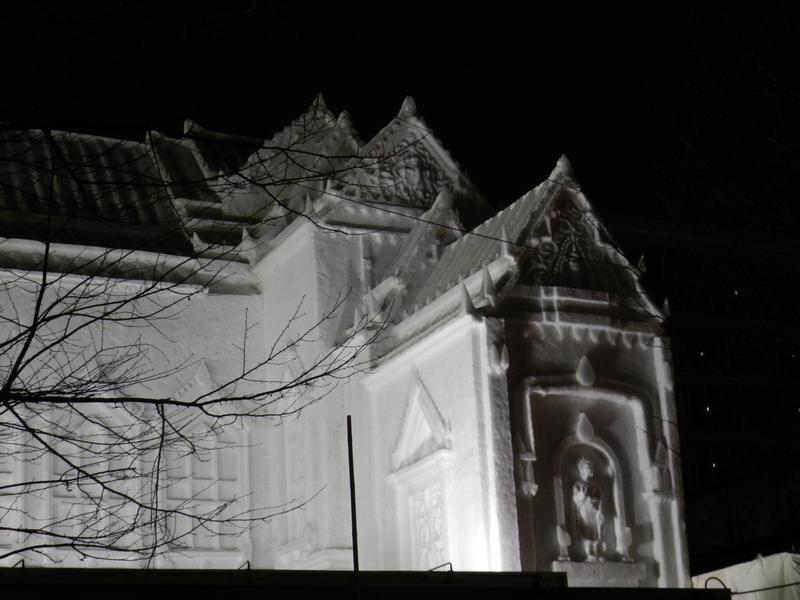 It did take the edge off the cold outside crafting this one-night snow sculpture, but my, was it nasty!!! Love, love the photos and the artistry. 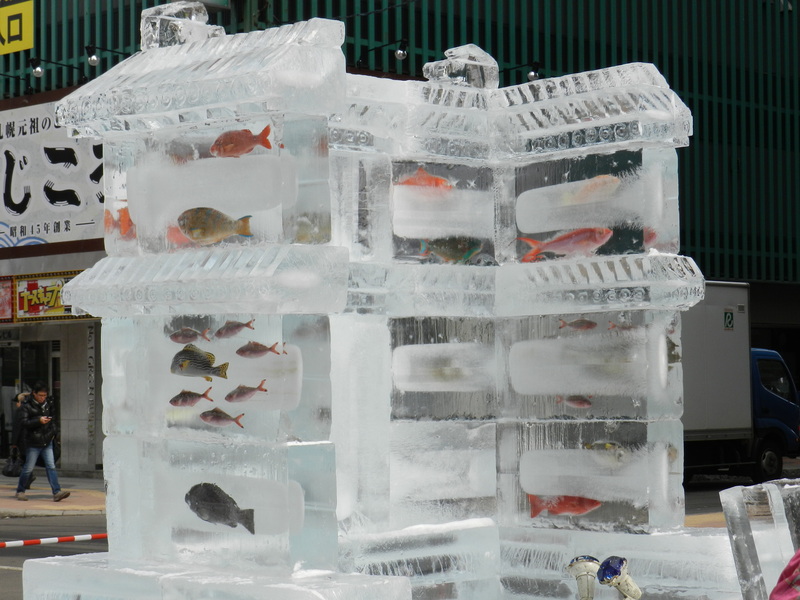 The fish in the structure were stunning. Dare I ask, were they still alive? Glad you are seeing all the sights whilst you can. Have a blast, keep sharing with us landlubbers who’d love to travel again….. It took you until college to get to Mad Dog 2020? Hmmm- you were a late bloomer I see. We were fans of “YEH GA MASTAH”… it went well with Bama football. Anyway- I have a feeling I`ll see another one of these in Canada! Not alive….. but definitely edible. How interesting! But what is going on with the fish and crabs? Are they artificial? Surely not real ones frozen into the ice:( Sitting here ready to get my Animal Protection gear into action. All those are fish and crabs that are local delicacies. No worries Sweffling- absolutely nothing in Japan goes to waste. Those will be eaten as soon as it thaws. 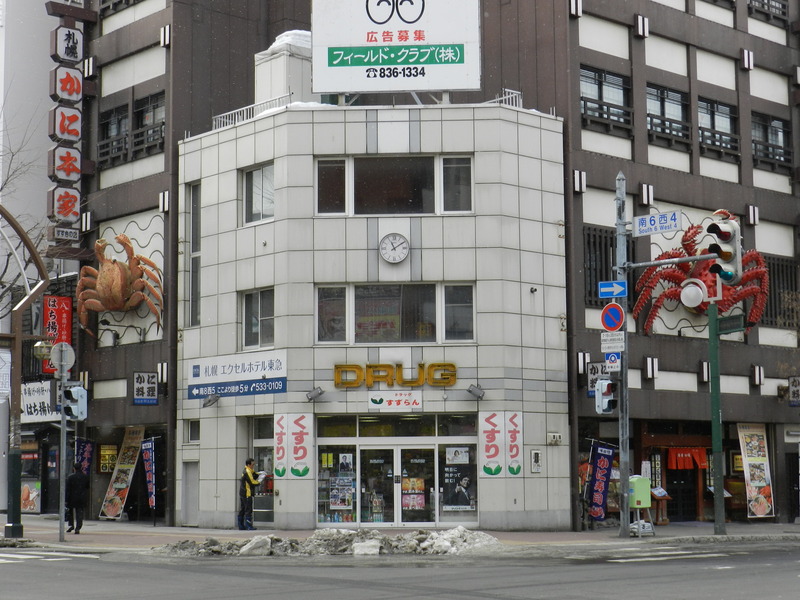 Oh- Sweffling- those giant scary crabs on the building? Those are fakes…. Thank you:) But I trust they were not frozen alive? You can see how my anxieties have been alerted. Great to hear that nothing goes to waste: if we are going to kill something it behoves us not to waste any of it. 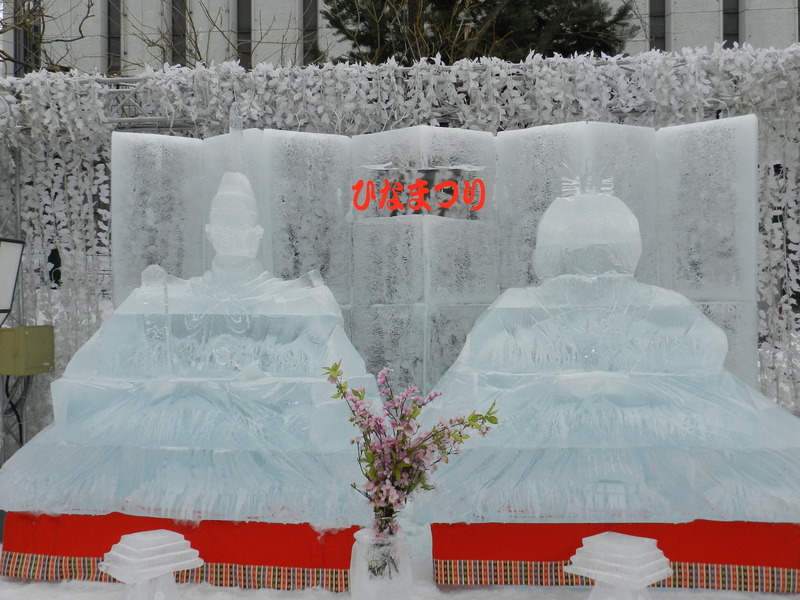 The ice sculptures are wonderful, another note for my travel itinerary, a ‘must see’. Glad to know you are able to make the most of your last few months. 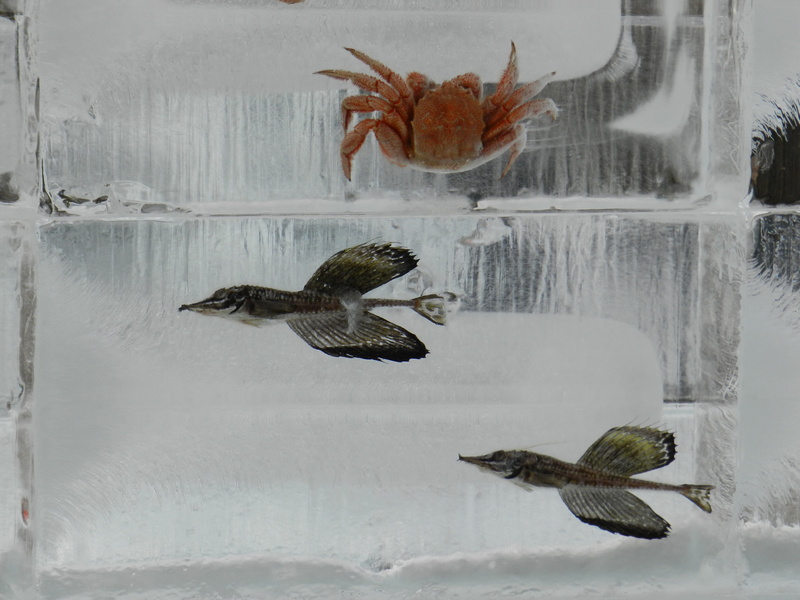 Hi, I was talking about the crab in the ice: even I, with my animal protection antennae at full extension, did not think the ones on the building could have been real:) But I appreciate your reassurances. I can revert to ‘stand-down’ mode now! I may have been on that bus tour. However, at the time I didn’t know what all the commotion was about, so thank you for clearing that up! Sit by me next time. Really Cool Pics, Emily, and Van Goughs ear was not bad either. Just glad yu did not find it in one of your meals! Thanks P. After the sake tour it may have been in one of the meals and I would have happily tried it. When, pray tell, do you move? 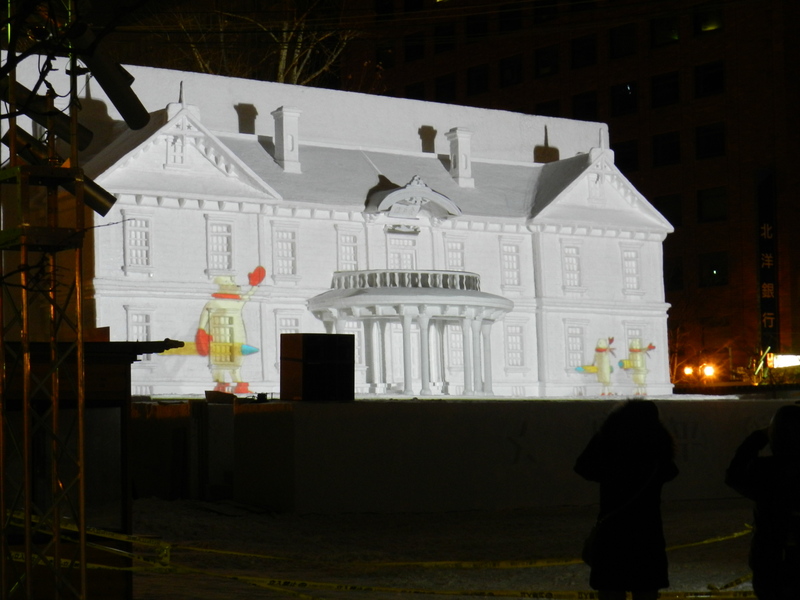 The way your luck is going, you’ll encounter yet another ice festival in Montreal, complete with language barrier, bundled up babies and all. We leave in June- Spouse is there already. 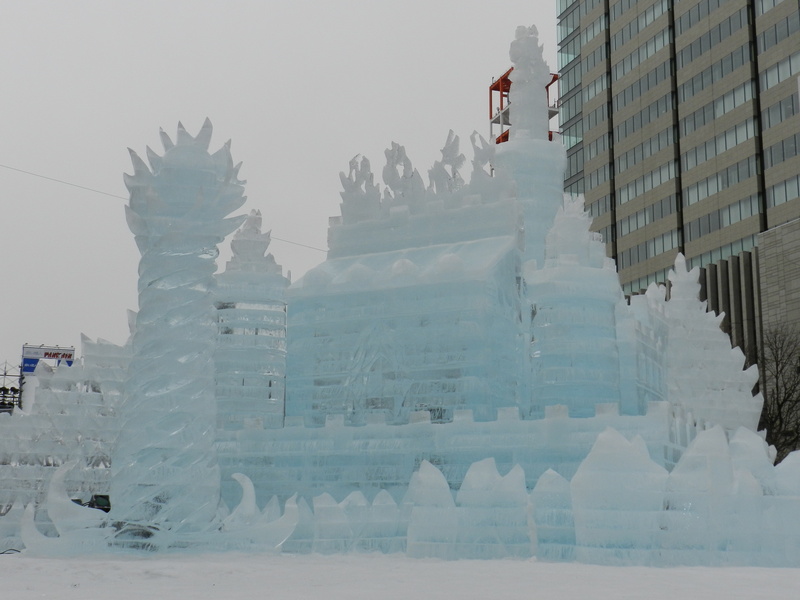 I think there is a big Ice Festival in Quebec City. Pictures next year!!! Now if you had had me in the bus, you would not have been bored! And I could have warned you if the Russians were coming. You would have made a good addition then! That`s cute! Our Giant Schnauzer used to hide behind me at the vet! 100 pounds of guard dog quivering behind me was hilarious! You know what I`m saying…. Although you can make great pictures out of anything. Just look at the great pics you took of me- case in point. 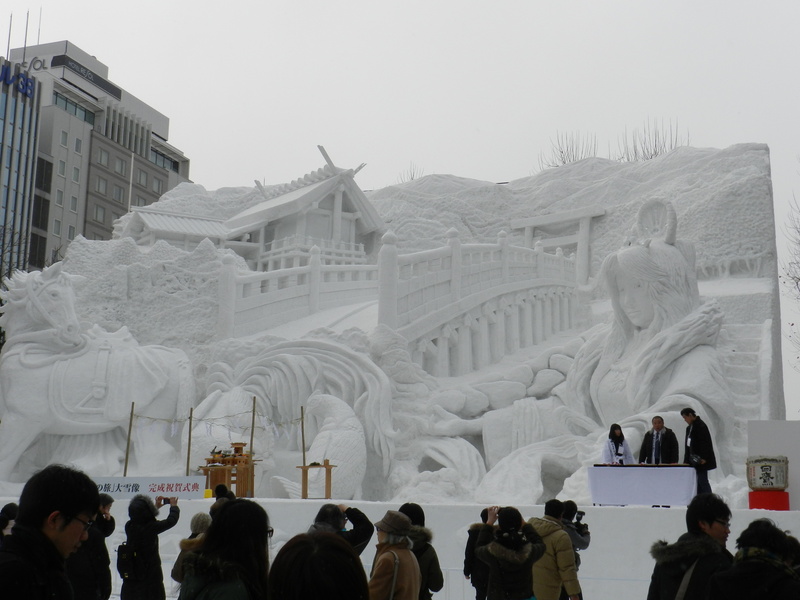 Wow – those sculptures are impressive. 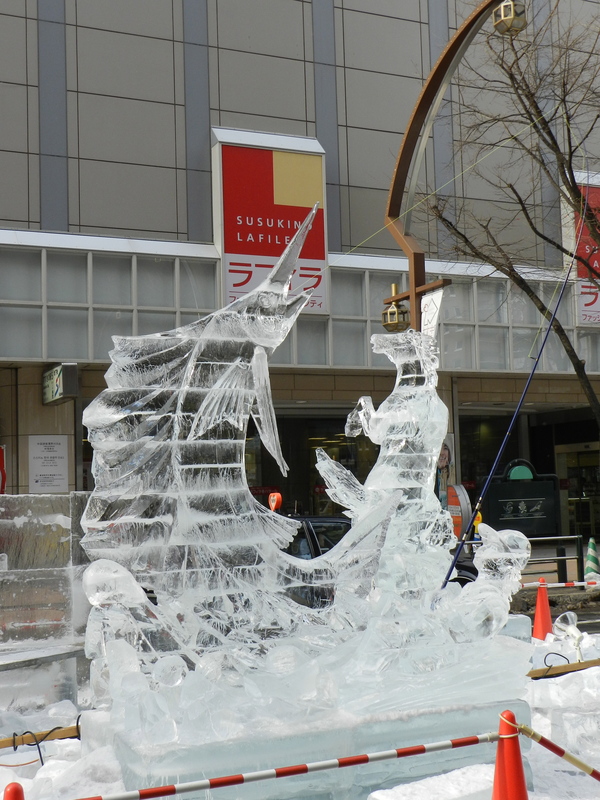 I’m always amazed by people who can wield chainsaws in the name of art. I know. I think the snow ones were the most amazing. How you can keep track of what you`re doing is amazing to me. I`Ve heard about the QC one for years. I`m looking forward to seeing it! That part of the tour was really fun. There used to be a lot of ice sculptures on the cruises my dad took us on as kids, but it was way warmer in the Caribbean than there. Looks a bit nippy, if you ask me. No wonder a nip of whiskey was in order! I think the guys that did them all work in hotels. Most hotels do them – the snow ones were the really amazing ones. Hey Vishnu- Thanks for stopping in! Glad you enjoyed! Reblogged this on Blog Peritaciones mga.